One of our delights has always been entertaining our friends and family. During the course of our marriage we have tried to do as much of it as our time and budget would afford. It is not cheap, and it does take a fair bit of effort. But we look on it as a ministry, enjoy it for what it is, and look at the cost as a love offering. We will never forget the times that our dear friend Carol Stagg would invite the two of us and our three children over to their house in Bangladesh. Her hospitality was like a warm hug on a cold day; it was such blessing. That is what we try to do. Last night we had the staff over for the evening. The reason, not that we needed one, was the birthday of a colleague. But with Christmas around the corner and Grad due tomorrow, it was more of an opportunity just to share some food and some music and be surrogate family to the expats here who feel the season pretty keenly. 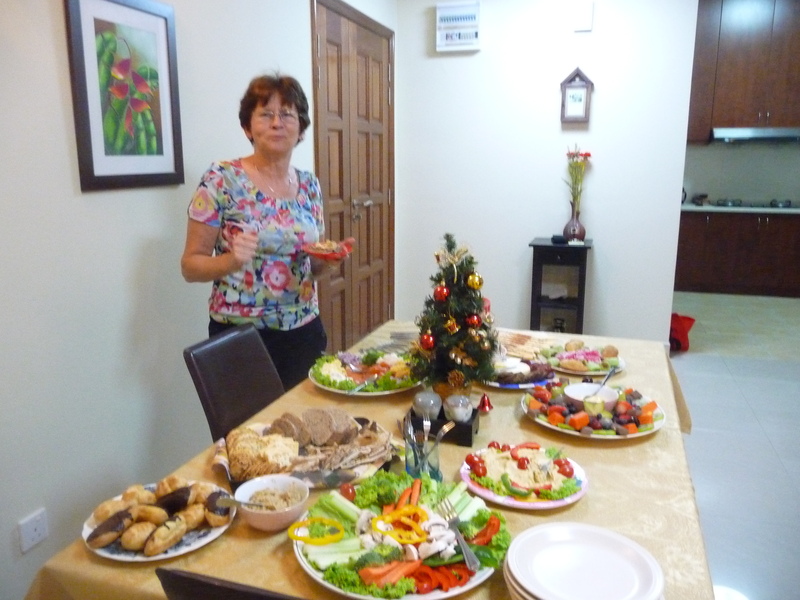 Pam did her usual marvelous job of preparing little goodies that included salmon and shaved egg roll-ups, garbanza and eggplant dips, an assortment of fresh fruit and custard – including star fruit and papaya, dragonfruit and blueberries – and a host of other small goodies. There was more than enough food to go around. We looked at pictures and discussed travel plans, and then we sang Christmas carols for well over an hour. I had run off some song sheets, and with another colleague to help me out on guitar, we played through just about every Christmas song we could think of. No one was in a hurry to leave, and it was a most enjoyable evening, filled with laughter and good cheer. Smiles were still in abundance today, evidence that we had accomplished our purpose in spreading a little joy around the staff. If we also spread a message about God’s love for mankind through the carols, then that would be a blessing as well, wouldn’t it!